The celebration of New Year is one of the oldest known to civilization, with the earliest observance believed to have been around 2000 B.C. Its observance on January 1st, however, is a relatively new tradition, first introduced by Julius Caesar in 46 B.C. when he added January and February to the Roman calendar. All around the world, people celebrate the coming on the New Year with traditions handed down over the centuries to either purge the “evils” of the past year or bring good luck and fortune in the new one. In Northwest Louisiana, while the cheerful memories of our New Year’s celebrations still linger, we celebrate again with the Krewes of Gemini and Centaur and their annual Twelfth Night Celebration. This marks the official beginning of the Mardi Gras season in the Shreveport-Bossier area, and all local Krewes are invited to the party and present their royalty. The Mardi Gras revelers begin their festivities toasting with flutes filled with champagne to warm the spirit. Party trays heavily laden with delicious and unique delicacies help to keep the celebrations flavorful. With the coming of the New Year, some may look back and reminisce about the days gone by, while others are inspired to make a fresh start with resolutions to make changes for the better. January is when it all begins, and in Northwest Louisiana January begins all the fun. Hot Bacon and Swiss Dip is guaranteed to be a hit at any gathering you attend this month, or any other month. 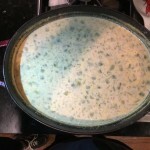 Combine the cream cheese, mayonnaise, Swiss cheese, green onions, and Tabasco sauce in a mixing bowl and beat until combined, scraping the bowl occasionally. 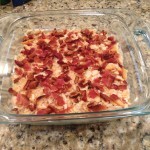 Spread the cream cheese mixture in a 2 ½ cup baking dish or a 9-inch round baking dish and sprinkle with the bacon and cracker crumbs. Bake at 350 degrees for 15 to 20 minutes or until bubbly. Sprinkle lightly with paprika and parsley and serve with assorted party crackers. 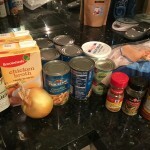 Another recipe that is sure to be a hit during these cold months is Creamy White Chicken Chili from the Mardi Gras to Mistletoe cookbook. Heat the olive oil in a stockpot and add the chicken. Cook for several minutes and stir in the onion. Sauté until the onion is tender. Add the undrained beans, green chilies, cumin, oregano, chili powder and cayenne pepper and mix well. Stir in the broth and sour cream. Simmer for 2 to 3 hours or to the desired consistency, stirring occasionally. Ladle into chili bowls and serve with white corn chips and shredded Cheddar cheese.